Burlingame is a city of 28,000 people in San Mateo County, California. It is on the San Francisco Peninsula and has a significant shoreline on San Francisco Bay. An early suburb of San Francisco, the city is named after attorney/diplomat Anson Burlingame. It was settled by wealthy San Franciscans looking for a better climate. Burlingame is known for its high residential quality of life with an excellent public school system. It is often referred to as the City of Trees due to the number of trees within the city and its numerous eucalyptus groves. This region experiences warm (but not too hot) dry summers, with no average monthly temperatures above 71.6 °F. 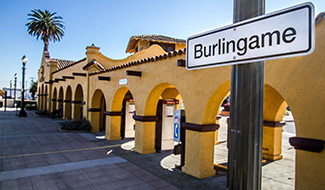 Burlingame has a warm-summer Mediterranean climate. The average sales price of Single Family Homes in Burlingame in 2016 was $2,159,940.